When playing defense, the ultimate goal of the defensive team is to keep the ball off their floor. A team in defense has blockers that take one area at the net while diggers plant themselves in the back court outside of the area that the block takes. In the video above the serving team (in white) is on defense. The team receiving the serve is in serve receive. Once the serve crosses the net, the defensive team's three blockers wait at the net to try and stop the ball from coming into their court. 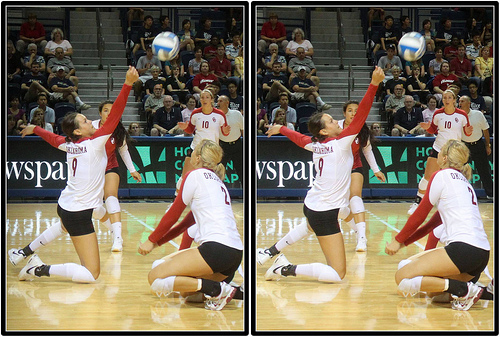 If the ball gets past the blockers, then the players in the back row play volleyball defense by digging the ball into the air to keep it off the ground. If they do, the team has two more contacts, for a total of three, to get the ball to one of their hitters and attack the ball back over the net. When the blockers take away a certain area of the court, the diggers should systematically cover the other parts of the court. This way most of the open spaces on the court are covered in team defense, making it harder for the opposing team to hit the ball to an open space. This is a basic explanation of volleyball defense. having an aggressive attitude are important for aplayer to be good at, especially if you play all six positions for your team during a match. As players learn more about the game, then they learn more advanced defense strategies like digging the seam of the block or playing more advanced defenses like rotational defense, perimeter, man up or man-back defense. All these things are a part of learning how to adopt your team's volleyball defense strategies. Let's learn more about defense, blocking, digging and how to defend your court by exploring the Related Links below. Or visit the pages in the How to Play Volleyball section in the drop down menu at the top of the page to get started. Planning to play on a middle school volleyball team? Click to register for our middle school clinics in June! Follow me on Instagram @coach_apchap to improve your game even faster! 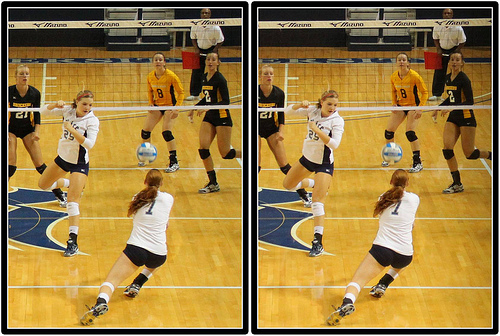 By April Chapple, Copyright 2015-2017 Improve Your Volleyball improveyourvolley.com All right reserved.